Musicplay – Should I Get the Digital Resource Package or Just the Website? I received a question this week, and think this is a good forum to post my answer. I am very interested in preK-2 curriculum. I was originally interested in the K-2 School Complete Digital Resource Package, and just created a one month sample trial of your on line resources! www.musicplayonline.com . As a new teacher, this is a gold mine! What great resources! 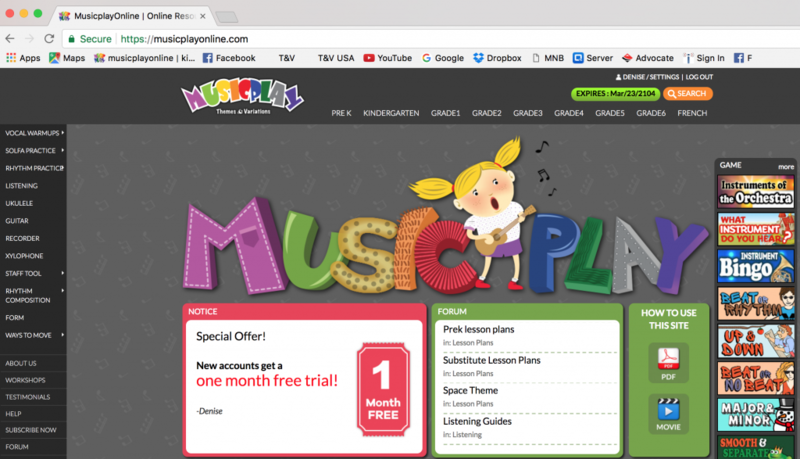 Can you explain the difference between the K-2 coomplete digital resource package and the MusicPlay on-line subscription. I want to best understand how they are different and what each resource entails. The K-2 Digital Resource Package includes printed teacher’s guides, the Listening Resource Kit 1-2, the Digital Resource for Listening 1 and the Digital Resources for Musicplay. This print and disk resource includes all the lesson plans, song suggestions, sequence and the projectable to teach the lessons for K-2. This material is all included in some form on the online site –www.musicplayonline.com. The projectables from the Digital Resource Disk are found in the song movies and Concept slides. The recordings that are on the CDs are embedded in the movies and concept slides, and the ACC tracks are just above the Concept Slides on the site. The print material that is in the teacher’s guide is found in various places. The monthly lesson outlines are in the Lesson Plans section. The song suggestions are found in teacher’s notes along with each song. I like to have the printed guide to refer to, I like have the recordings available as stand alone. (You can’t download them from the site). I really like to have the Digital Resources – the song movies – available to me when I teach in rooms where wifi is intermittent or signal is poor. With the package, you’d get a 1 or 2 year subscription to the site – I think a 2 year, so you’d have 2 year access. And if your teaching situation changes and the school won’t fund the site ($16 / month USD) you will still have the materials to use in your new teaching situation. Best case scenario for a teacher using Musicplay for the first time is to have both the Musicplay Digital Resource package and the website access and use them hand in hand. This entry was posted in Uncategorized and tagged best online curriculum, Denise Gagne, lesson plans, listening lesson plans, Musicplay, musicplayonline, musicplayonline.com, online music classes, online music curriculum, online music lessons, rhythm instrument ideas, rhythm instrument lesson plans on August 10, 2017 by Denise Gagne.